Bromances are awesome. We see them in all walks of life. I even have a couple myself. 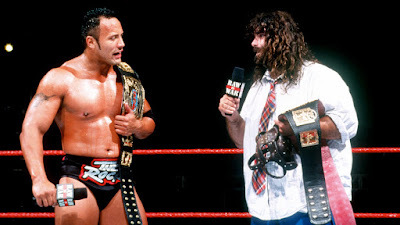 In the world of professional wrestling, it seems these relationships always end up going south. It's inevitable, so let's take a look at some of the best bromances in the business. Kevin Owens and Chris Jericho's bromance came to a screeching halt on the most recent episode of Monday Night Raw. When the union formed last summer it gave new life to the Jericho's character and helped endear Owens in the eyes of fans. Their SummerSlam victory over Enzo and Big Cass surprised me and I thought for a moment the two would get a run as Raw tag team champions. The timing of the breakup concerns me, though. My hope was that Owens would retain the Universal Championship against Goldberg later this month with the help of Jericho and then set up a match between the two at WrestleMania. But now I'm worried Goldberg will emerge as champ because of Jericho's interference, still leading us to an Owens-Jericho Mania matchup. I would have loved to see the two stick it out together longer, but with WrestleMania coming, you knew the fun was going to come to an end. Now I look forward to seeing what both of them can do against each in the ring. In the late 80s, "Macho Man" Randy Savage was on the verge of turning good when he feuded with the Honky Tonk Man. Then one Saturday night the fans fully embraced Savage after he was attacked by HTM and the Hart Foundation. Miss Elizabeth summoned the help of Hulk Hogan and the two became fast friends. For more than a year the Mega Powers dominated the WWF with their bromance, but all the way seeds of dissension were being planted. 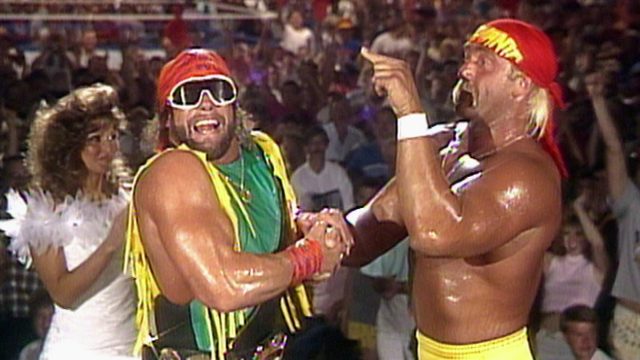 It was great storytelling and the Mega Powers exploded prior to WrestleMania V, 18 months after the bromance began. I'm going old school for this last bromance. "Gentleman" Chris Adams proved to be anything but when he turned on the Von Erichs in World Class Championship Wrestling. He aligned himself with Gino Hernandez and the two ran amuck on the babyfaces of the company. 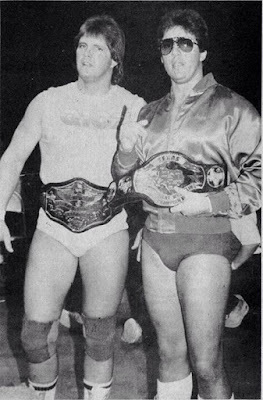 They were joined at one point by Jake "The Snake" Roberts and won the WCCW 6 Man Tag Team Titles. Adams and Hernandez also had a run with the tag team titles. But like all good things, the Gentleman and the Handsome Half-Breed had a huge falling out. Hernandez blinded Adams, which led to his return to being a face. Sadly, Hernandez died shortly after this while Adams was recovering from his injuries. The two never had that much-anticipated feud. Hernandez was just 28 years old and had so much potential. Of course, there are plenty of other great wrestling bromances. Edge & Christian, Shawn Michaels & Triple H, The Rock & Mankind and Scott Hall & Kevin Nash just to name a few. These men have all had their ups and downs too, just like history has shown us.